In this page, transition of evacuation orders and restricted areas are explained in chronological order. To know the current status of the area, please click here. Immediately after the accident, the government ordered residents in only 3km radius around the Fukushima Daiichi Nuclear Power plant (Here after referred as NPP) to evacuate on Mar.11, 2011. As the seriousness of the accident became apparent, the areas of evacuation order were gradually expanded. 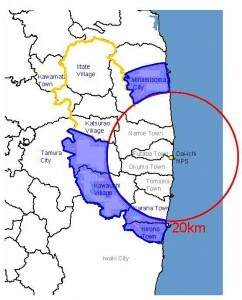 On March 12, 2011, after the 1st explosion at the nuclear reactor No.1, the government expanded the areas of evacuation within 20km radius from Nuclear Power Plant. On March 15, after the sound what was believed to be explosion was heard at the reactor No.2 & No.4, the government instructed the residents living between 20km-30km radius from the NPP to stay inside house. As the result of System for Prediction of Environmental Emergency Dose Information (SPPEDI) was still not reflected at this point, many people did not know that the wind and the rain on March 15th brought radioactive particles to spread northwest direction from the NPP. 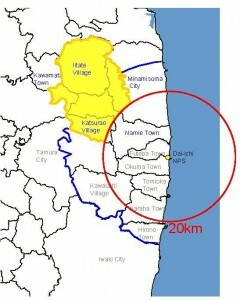 On April 22, 2011, the government designated the 20km radius around the NPP as a restricted area and prohibited entry into the area excluding those engaged in emergency response. 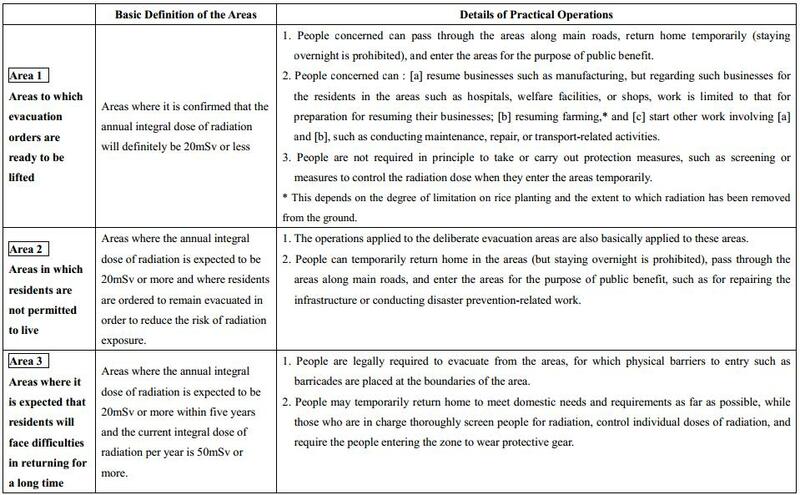 Source: Briefing material for technical workshop on the accident at Fukushima dai-ichi nuclear power station, TEPCO by Cabinet Office, Japan, Support Team for Residents Affected by Nuclear Incidents At the same time, the government designated 2 more different areas, “deliberate evacuation areas” and “evacuation prepared areas in case of emergency”. 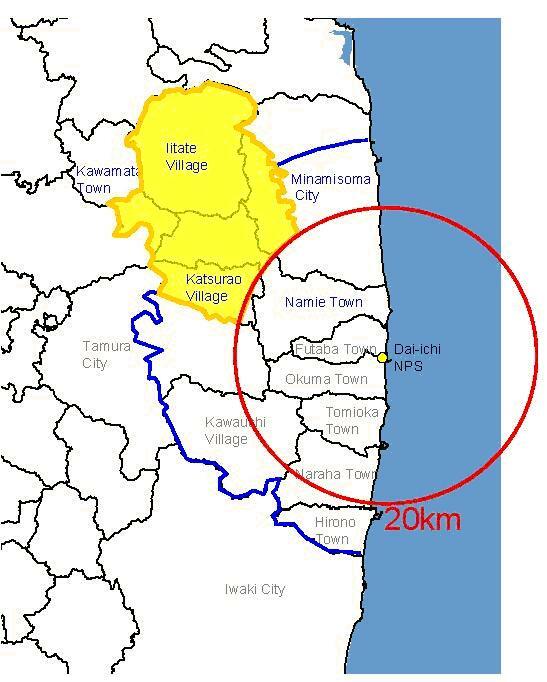 “Deliberate evacuation areas” were designated as the area excluding restricted area where the annual cumulative dose of radiation was expected to reach 20mSv/year after the accident. 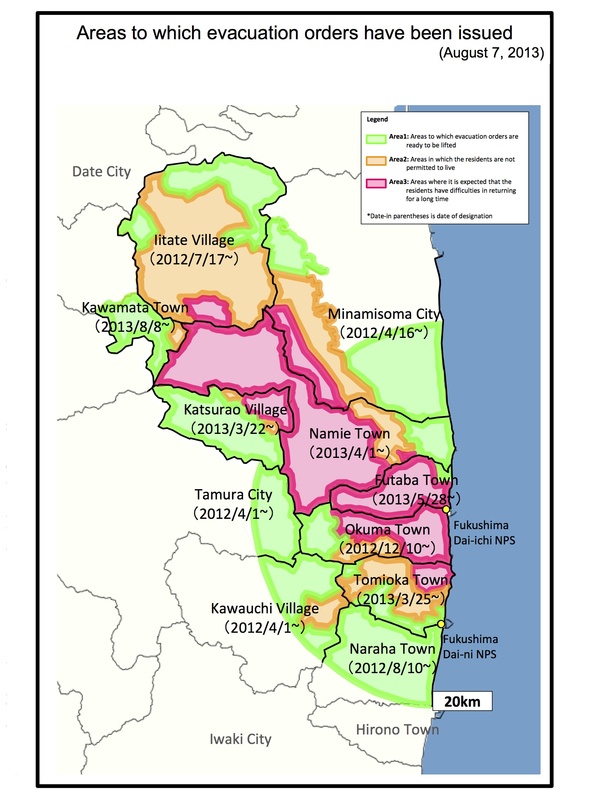 Residents lived in this areas required to evacuate within about a month to reduce the risk of being exposed to radioactive materials, though the instruction was too late. 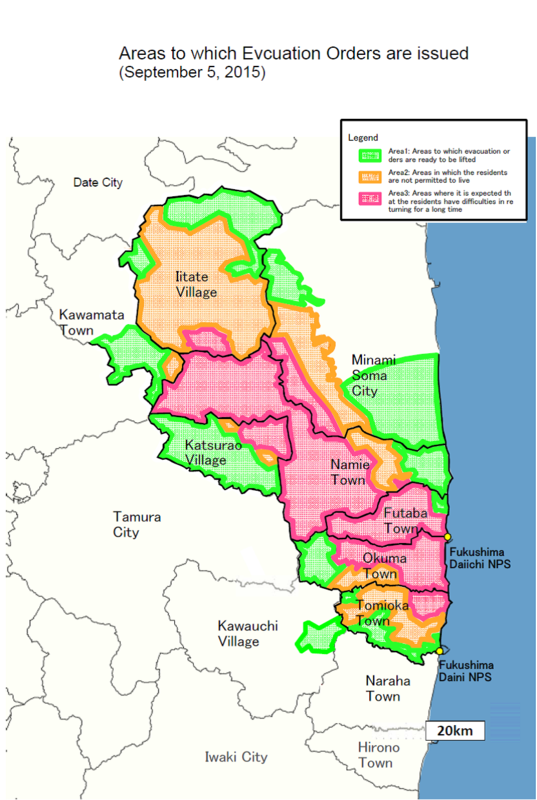 In addition, ‘Specific Spots Recommended for Evacuation（SSRE)’ was set on June 16, 2011 referring to the areas which contain high radioactive contamination, including numerous hot spots. The defined level of radiation in the SSRE suggests the cumulative dose equivalent to 20mSv/y or higher. 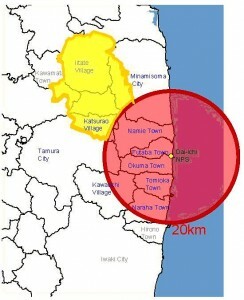 “Evacuation prepared areas in case of emergency” was designated as the areas excluding deliberate evacuation areas, among the areas of in-house evacuation on April 22, 2011. The residents are required to remain prepared to move out of the areas or in-house evacuation in case of emergency regarding the NPP. On September 30, 2011, the areas were lifted. The government decided to rearrange the restricted areas and areas to which evacuation orders have been issued after “the safety of the NPS was ensured” by completion of Step 2 on December 26, 2011. According to their plan, the restricted areas will be lifted after considering the period for preparing tasks such as confirmation of infrastructure and security. The areas to which evacuation orders have been issued will be rearranged into 3 areas responding to the annual cumulative dose. 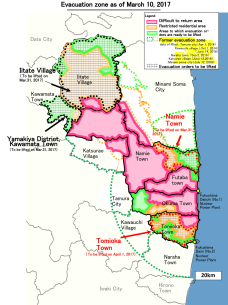 The government is gradually lifting evacuation orders in Area 1 (green area <20mSv/year). 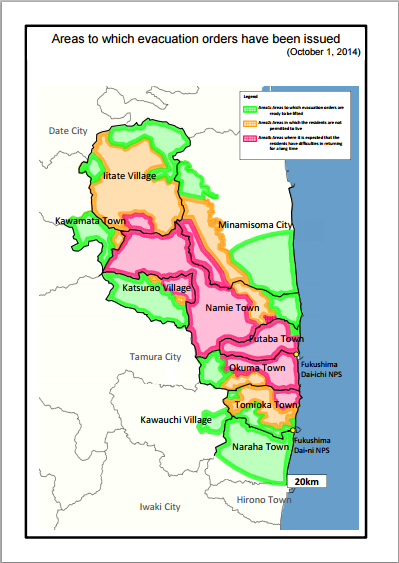 The government lifted evacuation orders from some areas in Kawamata Town, Namie Town, and Iitate Village on March 31, 2017. 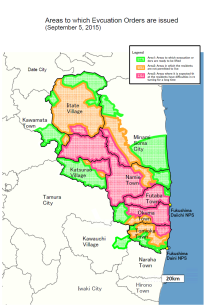 The government also plans to withdraw the order for some sections of Tomioka Town on April 1st, 2017.